Mental Health First Aid is an 8-hour course that gives people the skills to help someone who is developing a mental health problem or experiencing a mental health crisis. Evidence shows that the program builds mental health literacy, helping the public identify, understand, and respond. 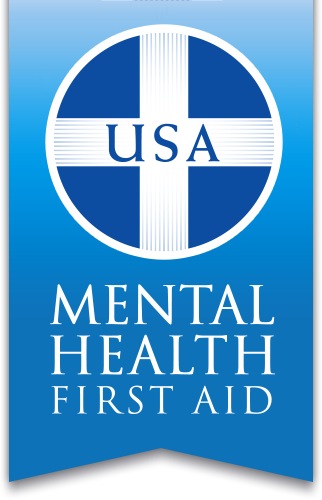 Mental Health First Aid is for anyone who serves or meets the public, teachers, church employees, first responders, social service agencies... for everyone. Every day, the opioid epidemic claims upwards of 116 American lives. That’s why Mental Health First Aid is ramping up its efforts to better respond to our nation’s opioid epidemic. We have recently launched an opioid response supplement that teaches people how to administer the overdose reversal drug, naloxone, if necessary. With this training, individuals can prepare themselves to combat the detrimental effects of the opioid epidemic for their loved ones and in their communities. 1 million people have already been trained in Mental Health First Aid. The opioid response supplement has the potential to make a substantial difference and save lives across the country. Look for more information about the opioid response supplement in the coming months to learn more. Anthony Bourdain’s and Kate Spade’s deaths by suicide have sent shock waves throughout the country. Coupled with data recently released from the CDC highlighting that suicide rates are going up for everyone between the ages of 10 and 75, we know something has to be done. There is a mental health crisis in America, and we all need to step up to the plate. Please call the National Suicide Prevention Lifeline at 1-800-273-8255 if you or someone in your life is thinking about suicide. And offer Mental Health First Aid as a resource to your friends and family. There are already more than 1 million people trained across the country. Although many people worry that asking, “Are you thinking about killing yourself?” will insult someone they are trying to help — or worse, encourage someone to act on suicidal thoughts — Mental Health First Aid teaches that the opposite is true. The more educated we all are on matters of mental health, the better hope we have of reversing the troubling trends developing around anxiety, suicide and depression. Let’s spread the word and make as much of a positive impact as we can. “Mental health challenges – such as depression, anxiety, psychosis and substance use – are shockingly common in the United States. In fact, more than one in five American adults will have a mental health problem in any given year. The National Council for Behavioral Health certifies individuals throughout the nation to provide Mental Health First Aid courses to prepare their communities with the knowledge and skills to help individuals who are developing a mental health problem or experiencing a mental health crisis. Identified on SAMHSA’s National Registry of Evidence-Based Programs and Practices, the training helps the public better identify, understand and respond to signs of mental illnesses”. For more information on Mental Health First Aid, visit www.mentalhealthfirstaid.org.